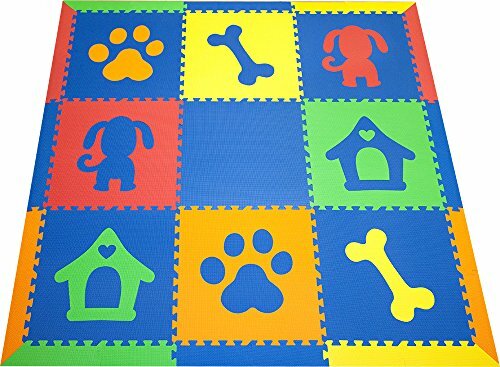 This SoftTiles Dog Theme children's play mat in Blue, Red, Orange, Yellow, and Lime is a fun playroom floor for dog lovers. This is a colorful mat that is perfect for all playrooms and is a nice alternative to the standard primary colored mat. Create the modern designer playroom that you'll want to show off! In this foam tile set, you will receive 8 Dog Themed Tiles (2 Dogs, 2 Bones, 2 Paws, and 2 Dog Houses), 1 Blue SoftTile 2x2 Foam Mat, 24 sloped border pieces in Blue, Red, Orange, Yellow, and Lime. The sloped borders are unique to SoftTiles and help provide a smooth transition from the mat to the floor. It helps prevent tripping and looks great at the same time. DESIGNER: Designer color palette of fun colors that are perfect for any living room, playroom, or nursery.